Today is the day Wayson Choy's second memoir, Not Yet, is released, and that matters here at Hugs because I designed a special scarf for Wayson. I wanted to thank him for everything he taught me in a summer workshop last year, and I especially wanted to celebrate the release of this book, which is about love and family and the strength that exists even in frailty. If you enjoy reading and in particular fine writing that hits home, Wayson is a writer whose books you should know. And the scarf isn't too shabby, either! 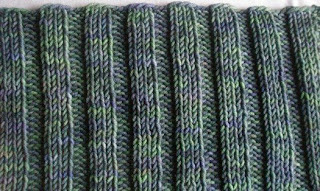 The simple design is reversible, easy to knit even while walking, great-looking for men or women, and packed full of lucky numbers. I love everything about this scarf pattern! It's beautiful and meaningful, and I love everything Wayson Choy has written. Can't wait to knit the Wayson! Ooooh! And I also love that blogspot is finally letting you leave comments, Binnie!! Since you were so nice to share with me, have you seen this new book? I'd like to try some of these patterns, but will have to wait for the library copy. I can't possibly buy every single knitting book that I love. Does the * for row 1 mean K2, (P3, K3) x6, P3, K2? Hello. Thanks for sharing this lovely pattern. Cant wait to try it. Your friend from Asia. 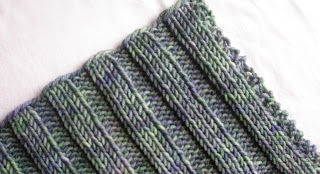 I'm halfway through knitting the scarf and the width of the scarf is scrunched up! So I get this skinny scarf instead of the beautiful pattern with visible panels above. What do I do? I'm using acrylic wool.